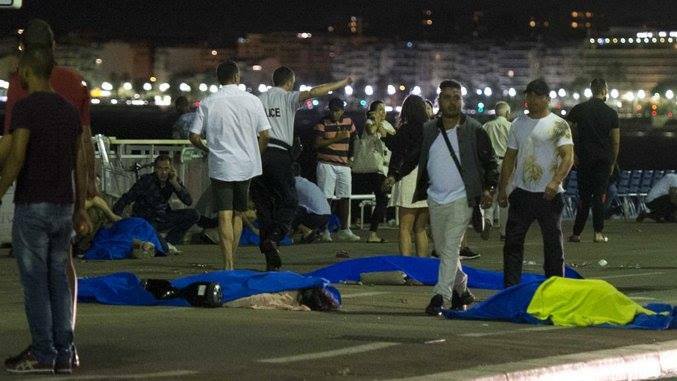 At least 80 people are dead after a lorry ploughed into a crowd attending Bastille Day celebrations in the French city of Nice on Thursday night, in what is being investigated as a terror attack. 14th July, Nice – At around 11pm, a heavy lorry rushed into the crowd of people who were watching fireworks for the celebration of the Bastille Day. The lorry was driven by a French citizen born in Tunisia. The vehicle arrived at a high speed and was alleged to drive for about 2km through the crowd. For now, authorities count about 80 dead and, among them there are also children, while hurt people are around 20. The 31-year-old killer who was driving the lorry had been shot dead by police. Authorities said he was already known to police, but it allegedly had nothing to do with ISIS. Anyway, French President Hollande announced that the attack was clearly a terroristic one and that France’s anti-terror unit is investigating the real nature of this attack. In the meanwhile, Holland declared the state of emergency for another three months. Follow the latest develoments with FRANCE 24’s live blog below.